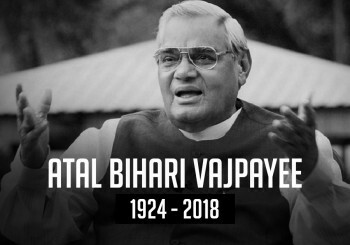 I never dreamt in my life ever that a day will come when I will have to pen a few lines about Atal Bihari Vajpayee’s passing away. Never had I imagined that I would one day have to bid farewell to Atal Ji. The still, lifeless body of Atalji lying in state disturbs my mind. My heart is unable to accept that Atal Ji has left on his eternal journey. I still visualize huge crowds of lakhs of people, flocking to hear and see Atal Ji. But today the leader is silent, in permanent slumber. I only hear the spontaneous outpouring of slogans ‘Atal Ji Amar Rahe’, ‘Jab Tak Sooraj Chaand Rahega, Atal Tera Naam Rahega’. My heart feels, what I see is true, but my mind is unable to accept this fact. For me, Atal Ji was not only a leader, he was my guardian, my teacher, my friend, and most of all, my guide. With his passing away, I have lost all. Atal Ji is out on his final journey, in the midst of lakhs of people, but somehow I feel, every individual is feeling himself or herself alone in this vast crowd. There is loneliness in my heart. The house where he used to live is empty. The house where I spent much of my time with Atal Ji, heard him recite his poems, is silent. The house, that used to resound with his laughter, is now silent. There is only a big portrait of Atal Ji, and all that is left, are his memories. I now remember the days that I had spent with Atal Ji, his conversations, his laughter, his anger, his advice, everything. An era has ended today. Atal Ji was not only ‘atal’ (enduring) in name, he was ‘atal’ in his personality, he was ‘atal’ in his ideology, throughout his life he remained ‘atal’ in honesty, he remained ‘atal’ throughout his life in the cause of truth. Men like Atal descend on this earth in ages. A great orator, a sensitive poet, an outstanding statesman. For 60 years he remained in the black-stained Hall of Politics, but came out unscathed. He became the ‘raja’ (king) but continued to remain a ‘faqir’(mendicant). You don’t find such politicians any more. I often feel that some of the words that Atal Ji wrote in his iconic poems may come true. He had written “Laut kar aaonga, Kooch se kyon daroon” (I shall come back, why should I be afraid of marching?) No more. No more shall we hear him vigorously reciting his poems, nor will I hear his scoldings, his gentle advices. I had the fortune of expressing my “mann ki baat” to him. At times, he also used to share his “mann ki baat” with me. I got his affection in abundance. A man who had a heart as crystal clear as that of a child. He sometimes used to sulk for the flimsiest of things, and he used to be pampered. No more sulking, no more pampering. Memories are many. I wanted him to be my guest in my show Aap Ki Adalat. To bring him to the show was not so easy. I knew Atalji’s foster daughter Namita from my college days. Ranjan Bhattacharya was with me in college. I took their help and persuaded Atalji to come to the show. Atalji used to fob off my requests with a laugh. Once I took hundreds of letters of my viewers to show him that people really wanted to see him on the show. He guffawed, and said you take all these letters from people when you meet them. At last he agreed, but on the day of recording, he backed out. He flatly refused to come. I rushed to Atalji’s house, tried to persuade him, but he said his party has forbidden him to speak. I told him, ‘well, I am seeing for the first time that you are following the party’s diktat’. Atalji was somewhat angry, but Namita intervened. She told him, ‘Baapji you had promised to go’. All of a sudden, Atalji stood up and said, let’s go. That’s how I got him in Aap Ki Adalat. Atal Ji, as an individual, was a rarity. He never had shallow thoughts, nor would he ever make shallow remarks. After his first ‘Aap Ki Adalat’ show was telecast, he became Prime Minister and his government lasted for 13 days. H. D. Deve Gowda became the Prime Minister, and there was a dinner at Rashtrapati Bhavan. Atal Ji told me at that dinner that he wanted to meet me. I met him the following day. He said, I have three things to tell you. In humility, I told him, ‘you are my elder, you can say anything’. He replied: ‘I have some burden on my heart, which I want to share with you. First, I am grateful to you. The process of my becoming the PM started with your show Aap Ki Adalat’. Again, in humility, I told him: ‘Atal Ji, you have a 50-year-long ‘tapasya’ behind you, and you are speaking of one TV show?’ He replied: ‘I have seen change in the eyes of people’ (after they watched the show). I replied: ‘Atal Ji, you have something very big. I have nothing more to say’. He said: ‘No, I have two more things to tell you. And today you shall not talk, you shall hear me. The second thing I want to tell is that, I was PM for 13 days but I did not meet you’. He replied: ‘No, I should have met you. And the third thing: Hum aapse mitrata karna chahte hain’ (I seek your friendship). I returned home and could not sleep well for the next two or three days. I thought, a big politician like him should not have said such a big thing to me, nor was there any need to thank me, nor should he have expressed gratitude. Moreover, there was no need for him to say, I seek your friendship. Soon thereafter, there were general elections, and I used to sometimes praise Atal Ji while anchoring my show. I used to make these comments from the depths of my heart. One day, I got a call from Ranjan. “Atal Ji is calling you. He is at the airport, and will be there for two hours. He has come from Chennai and will be leaving for Patna”, he said. He replied gravely: “Yeh theek nahin hai. Rajatji aapki taaqat aapki vishwasniyata me hai. Sab dalon me aapke dost hain. Sabse mitrata hai. Sab aapki baat sunte hain. Ismey koi samjhauta nahin hona chaiye. (This is not good. Rajatji, your strength lies in your credibility. You have friends in all parties. You are friends with them. They listen to you. There should be no compromise on this). I replied: “Atalji, this is after all election time. Let the elections be over, then I will think”. Can an individual think so high? Such a towering personality, and his great thoughts. There can be no politician or statesman like him, who can think and speak like this. This, in essence, was our Atal Ji. Such men do not disappear. Atal Ji shall always remain in the core of our hearts. His life was an open book. He was a ‘faqir’ (mendicant), he was ‘faqqad mijaaz’ (mind of a vagabond). He never compromised in life. I learnt a lot from his life, his personality and his closeness. His reply: “Humse bolne ki kalaa mat seekho. Agar kuch seekhna hai, toh seeko, ki chup kab rahna hai” (Don’t learn the art of oratory from me, if you want to learn, then learn the art of when to remain silent). It was a brief reply, but loaded with endless possibilities. I fail to understand what to recount now, and what to omit. I only have his face in front of eyes, as I watch his lifeless body disappearing into oblivion. And my heart cries out in anguish: “Atal Ji, wake up just once, and say – Panditji, hum kahin nahin gaye, hum yaheen hain, tum sabke beech, tum sabke saath (I haven’t gone anywhere, I am here, amongst you, with you, always).